For Reese Witherspoon and Robert Pattinson, Water for Elephants was a romantic fantasy, and they have moved on to the next glamorous project. For Tai it was a nightmare reality, and she remains in the hands of those that ADI caught on film abusing her, Have Trunk Will Travel (HTWT). Tai is back in the circus, performing the same tricks seen in the film. ADI recently filmed her and Rosie (the HTWT elephant star in Zookeeper with Kevin James), with El Zagal Shrine Circus, in Fargo, North Dakota. 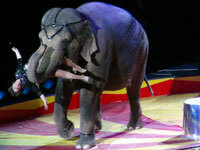 At the circus, HTWT trainer Joanne Smith confirms that the two elephants are Tai and Rosie. We released new footage showing the circus performance alongside the brutality that created those tricks. In the footage taken at HTWT, Smith is seen electric shocking the elephants with a stun gun, and hitting and hooking them, saying to our investigator, “Don’t you be takin’ pictures of me hookin’ on them”. Last year ADI released the footage of abuse at HTWT after the makers and stars of Water for Elephants, American Humane and HTWT, claimed Tai was treated with love and affection and never abused. 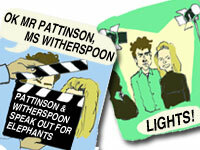 At the time we believed that Pattinson, Witherspoon and the film makers had likely been duped. We sent them the video and asked them to speak out. Not a word. We sent the video to the studio, producers and director. No reply. Letters were sent to the makers of Zookeeper and its star, Kevin James. Again, no response. The new video is posted on the Facebook pages and Twitter feeds of Pattinson, Witherspoon and James, asking them to support ADI’s campaign and speak out against the abuse of performing animals in movies. The abuse is not going to stop until the stars speak out. 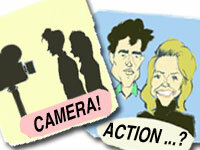 Contact ADI for our movie letter writer’s action pack: by email info@ad-international.org or by phone 020 7630 3340. Click here to donate now and help us to expose the abuse and to end the use of animals in circuses.